Explore our phenomenal variety of personalised gifts and indulge someone special with something with their name on it. If you’re looking for the perfect gift for any occasion, look no further than our stunning array of personalised gifts and treats. 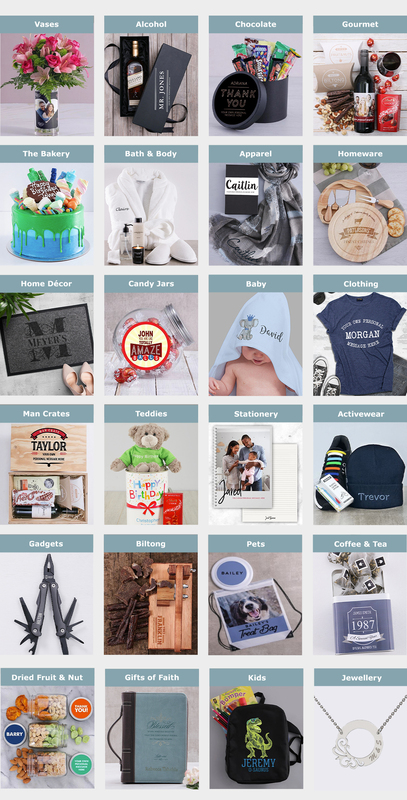 Whether it’s personalised gifts for him or personalised gifts for her, the gifting experts at NetFlorist have a wonderful variety of gifts, including baked treats from our bakery, such as delectable cupcake jars, sweet and savoury macaroons to personalised apparel, such T-shirts and hoodies. A gift is only as amazing as the name that’s on it, so put their name on a wonderful gift from our incredible range of personalised gifts,such as personalised flowers for her, or personalised man crates for him. From fine alcohol, that is masterfully crafted with a perfect balance of sweet and oaky flavour, to a scrumptious variety of chocolate delights that your loved one can indulge in to their heart’s content. As South Africa’s leading gifting company, NetFlorist has the best personalised gifts for the one special to you. For the right gift, for the right person, and for the right occasion, we have a wonderful assortment of personalised gifts and treats that they deserve. NetFlorist offers sameday and nationwide delivery, so send a personalised gift to someone special and have it delivered straight to your loved one’s doorstep!